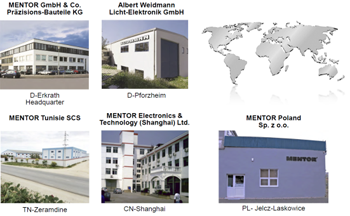 Headquartered near Düsseldorf, Germany, MENTOR has component production plants in other German locations as well as substantial and highly-invested facilities in low-cost regions such as Poland and Tunisia. All production, including tooling, is performed in-house. As long-established first-tier suppliers to many major automotive and OEM companies, MENTOR is well-versed in rapidly designing a product and then moving it quickly to high volume production, subsequently delivering in a timely and impressively reliable manner. By definition, MENTOR is thus highly certified, extensively quality-audited and has a track-record of regularly providing the most innovative and cost-effective component solutions, backed-up by MENTOR’s legendary efficiency and reliability.